No matter what is causing your conjunctivitis, you should not wear contact lenses until you have had no symptoms for 48 hours, and for 24 hours after the last dose of any eye drops or ointment (if you are using them). Throw out any disposable contact lenses you have been wearing and use a new pair. If your lenses aren't disposable make sure you thoroughly clean them. You can also clean any discharge off your eyelids and lashes. Use something without lots of small fibres to do this, for example a clean facecloth or a makeup wipe. Mild or moderate infective conjunctivitis usually doesn't need any further treatment. Your tears contain chemicals that fight off germs (bacteria and viruses). Infective conjunctivitis often settles by itself within seven to 14 days. 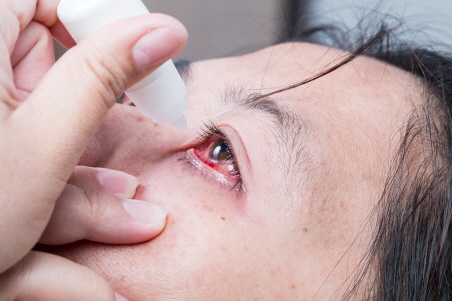 Sometimes viral conjunctivitis can last a lot longer and take weeks to completely go away. If your symptoms get worse, see a doctor. Bathing your eyes with cool clean water may help to soothe any irritation. Lubricant eye drops may reduce any discomfort. You can get them over the counter at a pharmacy, as well as on prescription from your GP or optometrist. If your conjunctivitis doesn't clear by itself, your GP or optometrist might prescribe antibiotics. This pamphlet gives more information about who gets conjunctivitis and how to stop it from spreading. Should I keep my child at home if they have conjunctivitis? The Ministry of Health recommends keeping your child home from school or preschool while there is a discharge from their eye, or until the infection has been treated for more than 24 hours. avoid the cause of the allergy, if possible. For example, close the windows, drive with the windows shut and internal air circulation on in your car, and wear wrap-around sunglasses when out. You can also try using lubricant or decongestant eye drops to ease any discomfort. Storing lubricant eye drops in the fridge so they are cold can be soothing. If your symptoms are mild you might not need any treatment. You could try lubricant or decongestant eye drops to decrease any discomfort. Ask a pharmacist for advice. If your symptoms are more severe then you can try mast cell stabiliser eye drops (these stop your body releasing the chemicals that cause an allergic reaction) or antihistamine eye drops. You can take these with antihistamine tablets to reduce the allergic reaction, and can get them on prescription from your GP or optometrist. Some people find one product works better than another, so if the first one doesn't help try another. If your eyelids are very swollen, it may take several days for the drops to make your symptoms go away. If they are not helping then see your GP or optometrist. Stop wearing your contact lenses until the symptoms clear. Make sure you clean and store your lenses properly. You may need to change the type of lenses you use to stop the problem returning. You can also use allergy eye drops (see above) to ease the symptoms. Avoid whatever caused the reaction. If it's caused by shampoo or cosmetics, change the brands you use or switch to non-preserved products. American Academy of Ophthalmology – Conjunctivitis: What is pink eye? More information about the different causes of conjunctivitis, how to tell the difference and how to treat them.